The Family History Project, sponsored by The History Channel, is a Web filled to the brim with informative ‘how-to’ tips for people interested in their British and Irish ancestry. Here you will find useful articles that will help you accomplish your research (for example, Tracing Emigrant Ancestors); expert advice (for example, Search the 1901 Census); video training clips (for example, Army Records); and genealogical events in the UK and Ireland. In additional the Web site provides a place for your personal Web page where you can build and store your family tree as well as features useful links to the National Archives, the Royal British Legion and the Imperial War Museum and more. This Quick Tip is also available as a free video. Have you ever searched the records of a town, only to find nothing about your ancestor? In these situations, good genealogical methodology suggests to search the records of nearby towns. Legacy Family Tree’s Radius Search tool will provide you with a list of localities within a given distance from the original location. Step 1. To use the Radius Search tool, first you’ll need to make sure that you have installed Legacy’s Geo Location Database. 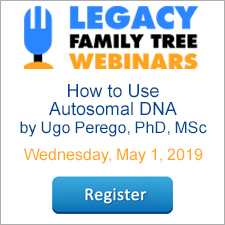 This database is a collection of nearly three million current locations worldwide divided into six regions: Pacific Islands, United States, Africa, Americas (non-USA), Asia, and Europe. Each location includes the name of the city, the county or province, the state, if any, and the country name. Along with this information the latitude and longitude coordinates are also included. For step-by-step instructions on installing this database, from Legacy, click on the Help menu, then click on Search for Help On. On the Index tab, type in this phrase: Geo Location Database Setup, then click Display. Follow the instructions to complete the setup. You’ll then be able to use the Radius Search tool. Step 3. In the example above, Woodstock, Windham County, Connecticut is the known location. To find a list of surrounding locations, click on the binoculars button in the far lower right. Enter the desired mile radius, and click OK. Legacy then searches the Geo Location Database for all locations within the radius. In the example below, there are 18 known locations within 5 miles of Woodstock. Your search can now continue into the records of these towns. Holly T. Hansen, President http://www.myancestorsfound.com, Editor of Everton’s Genealogical Helper Magazine. NOTE: This encyclopedia is not a place to find all the ancestors of John Doe or all the descendants of John and Mary Smith. The World Wide Web already has many online message boards and databases that perform that function well. Instead, the Encyclopedia of Genealogy serves as a clearinghouse of genealogy techniques: where to find records, how to organize the data found, what the terminology means and how to plan your next research effort. The Encyclopedia of Genealogy is created by genealogists like yourself. In fact, YOU can help by adding content: your own knowledge and expertise can help others. If you see anything in this encyclopedia that is incorrect, YOU can change it! If you see anything that is incomplete, YOU can add to it! If you note anything that is missing, YOU can add it! This encyclopedia will succeed because people like you contribute nuggets of information. When enough “nuggets” are added, the Encyclopedia of Genealogy will become a gold mine. Visit the Encyclopedia now by clicking here. MapYourAncestors at http://www.mapyourancestors.com will generate a Google Earth Map from the family tree and photos you provide, and they will do it free! The MapYourAncestors home page displays the family tree and map for President George W. Bush. There are also links for his Life Chronology map and Ancestor Chronology map. MapYourAncestors provides downloadable Excel spreadsheets for you to fill out and directions for emailing them when completed. One spreadsheet is for beginners and the other is for advanced family historians. Allow MapYourAncestors 48 hours to generate a map and your family tree will be plotted on Google Earth Maps. Currently this service is free; however, they request support through donations and ad clicks. Hey, you can also use this web site to plot your next research trip to the places your ancestors lived! 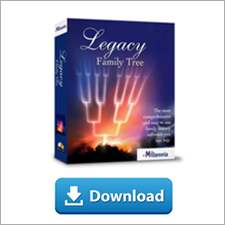 It’s been 1 year, 9 months, and 20 days in the making — On Thursday, September 8, 2005, at the FGS Conference in Salt Lake City, Utah, Legacy Family Tree 6.0 will be officially released! The wait will definitely be worth it. Location Prepositions - On the Add/Edit Location screen (reached from the Master Location List), there is a field for the location preposition. This defaults to “in” but can be changed to other prepositions like near, around, outside, northwest, etc. These prepositions are then used when building report sentences. News: At 2:21:34 p.m. EDT on August 11th, 2005, Anne Slane, a cataloger for Worthington (Ohio) Libraries, entered holdings information for the book The Monkees: The Day-By-Day Story of the 60s Pop Sensation, becoming the one billionth holding record in the WorldCat database. What is it? WorldCat is a worldwide union catalog created and maintained collectively by more than 9,000 member institutions. With millions of online records built from the bibliographic and ownership information of contributing libraries, it is the largest and most comprehensive database of its kind. Access: The complete WorldCat database cannot be searched freely on the Internet. Instead, the user needs to go through a library that has purchased a subscription. Many libraries offer access to this database via the Internet with a library card. If, for example, you have a membership with the Godfrey Memorial Library, you can search WorldCat online. Practical Use: W. Eguene and Joyce Cox published a new history of Washington County, Tennessee in 2001. I waited for the Family History Library to obtain a copy of it. By 2004, they still did not have it in their holdings. I then used the WorldCat database (with my $35 annual subscription to Godfrey) to locate a library that had the book. WorldCat gave me a list of 34 libraries worldwide that had the book. I printed this list, brought it to my local public library, and through their Inter-Library Loan (ILL) service, within a week, I had a copy in my home to use. If you already have a library card for your public library, you may already have access to this great resource. Give your library a call — and you may soon have access to the collections of the world.